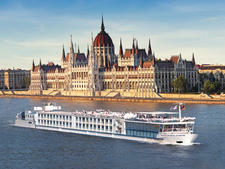 Completing Travelmarvel's fleet of five ships is newly refurbished MS Excellence Queen. 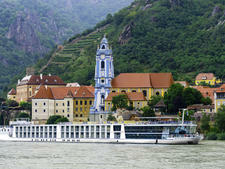 The ship, originally built in 2010, is 361 feet long, carrying 142 passengers in 70 staterooms and one suite. Accommodations range from spacious Window Staterooms to Standard French Balcony Suites, Larger French Balcony Suites and a single, expansive Owners Suite. The 16 Window Staterooms are 140 square feet in size and located on the Lower Deck. Moving up in size and up one deck are the Standard French Balcony Suites, which are located on the Middle Deck, and run 172 square feet. The remaining Larger French Balcony Suites are even more spacious at 183 square feet and are located on the Upper Deck. The single Owners Suite is also on the Upper Deck, measuring 323 square feet. Amenities in all staterooms include a deluxe queen-size bed, a vanity with a hair dryer, a minibar, flat-screen TV, a closet with a safe, a bathroom with a shower, and a deck. Window Staterooms have two portholes, the two categories of French Balcony Staterooms have floor-to-ceiling sliding doors, and the Owners Suite has an additional sitting area, a floor-to-ceiling glass window and a French balcony. 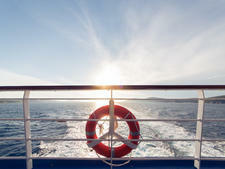 The MS Excellence Queen has a Sun Deck on top of the ship, with a glassed-in Sky Lounge offering panoramic views forward. There is another lounge and bar on the Upper Deck, and the Queen Lounge aft on the same deck. A library, dining room and small fitness center are located on the Lower Deck. Travelmarvel caters largely to Australian and New Zealand passengers, aiming to offer a value-for-money experience that isn't short on comfort and style. Its fares have many inclusions, from sightseeing, gratuities and port charges to complimentary use of bikes and wireless Internet. Also included in the fares are coffee, tea and bottled water, along with complimentary local beer, wine and soft drinks, which are served with lunch and dinner. Another perk is Travelmarvel's Insider Experiences, which allow passengers to 'live like a local', from learning the production of Schnapps at a family-run distillery in Austria to enjoying a private Oktoberfest event in Bavaria. Princess Panhwar, a 36-suite river ship, was launched in 2016. 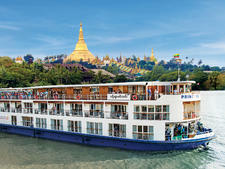 The 61-metre vessel carries 38 crew and offers fully escorted cruises on Myanmar’s Irrawaddy River. The 170-passenger Travelmarvel Jewel offers a comfortable, value-for-money cruising experience that includes some tours and select alcoholic beverages at lunch and dinner, among other perks. The 170-passenger Travelmarvel Diamond offers a comfortable, value-for-money cruising experience that includes some tours and select alcoholic beverages at lunch and dinner, among other perks. The 164-passenger Travelmarvel Sapphire offers a comfortable, value-for-money cruising experience that includes some tours and select alcoholic beverages at lunch and dinner, among other perks. 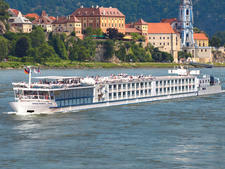 Launched in 2006, MS Excellence Rhone cruises the Saone and Rhone rivers, carrying up to 142 passengers in 71 staterooms and suites.